Do I Win a British "Islamophobia Award"? In addition to terrorism and other forms of violence, the current war also involves a battle of ideas, with Islamist totalitarians on one side and their opponents on the other. To convince the undecided, each side tries to discredit the other. This is a battle I am intensely engaged in to show the true nature of the Islamist organizations. In particular, I focus on the Council on American-Islamic Relations, the most powerful such organization in the most important country; and CAIR returns the favor by throwing more of its calumnies to me than to any one else. Others jump into the picture from time to time. A colorful example of this was issued today by the badly misnamed "Islamic Human Rights Commission," a British organization that includes on its advisory board some of the most extreme Islamic figures of the Western world (Mohammed Al-Asi, Muhammad Al-Massari). 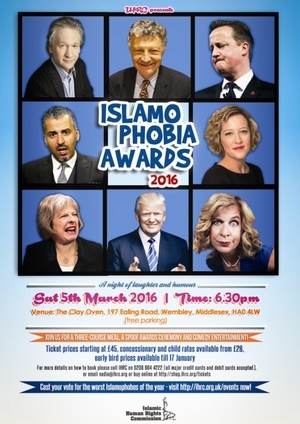 The IHRC announced its sarcastic Islamophobia Awards for 2004 (a bit early no?) in five categories: British politician, non-British politician, media organ, media personality, and an all-purpose "Islamophobe of the year." In Hollywood-style, each category has three nominees, from which the finalist is chosen. Perhaps I should be inspired by this to give out mock awards of my own to the Islamists. These might include such creatively named ones as "Outstanding Jihad Apologist," "Outstanding Counterterrorism Saboteur," "Outstanding Media Manipulator," and "Outstanding Dhimmitude Advocate." Though neutral on Islam, I take a strong stand on Islamism, which I see as very different. ...The one is a faith, the other an ideology. Whereas the closest parallels to Islam are Judaism and Christianity, those closest to Islamism are other radical utopian "isms," namely fascism and Marxism-Leninism. Islamism is a global affliction whose victims count peoples of all religions. ... Moderate Muslims and non-Muslims must cooperate to battle this scourge. Aug. 18, 2004 update: Polly Toynbee acknowledges her having "won" the IHRC's "Most Islamophobic media personality" award in a column today, noting that it caused her "a bombardment of emails of both extreme pro- and anti-Islamic poison, each one more luridly threatening than the last." As for her own views, they could not be more reasonable: "Fear of offending the religious is gathering ground on all sides. It is getting harder to argue against the hijab and the Koran's edict that a woman's place is one step behind. It is beginning to be racist for teachers or social workers to object to autocratic patriarchy and submission of women within many Muslim communities." This firm good sense takes the sting out of losing the first-place position to her. "To the IHRC, fighting "Islamophobia" means opposing laws that prohibit Muslim women from wearing headscarves, boycotting companies that do business in Israel and supporting radical Muslim clerics in custody (such as Sheikh Abdul Kareem Obeid, the leader of Hezbollah in Lebanon, who was freed in January), Chechen independence and the Palestinian intifada." At the end of a devastating analysis of the IHRC's activities and statements, D'Hippolito concludes that, "Given its selective outrage and its advisors' values, the Islamic Human Rights Commission is as much of a non sequitur as a National Socialist Human Rights Commission would be." Dec. 17, 2005 update: Rats, am again a runner-up for an IHRC "Islamophobia" award, this time competing in the Americas category for 2005. The competition is pretty stiff – "George W. Bush (President, USA); Oprah Winfrey (Chat Show Host); Front Page Magazine (website); Daniel Pipes (journalist)" – so I can't feel too disconsolate. Oh, and George W. Bush won this little competition. 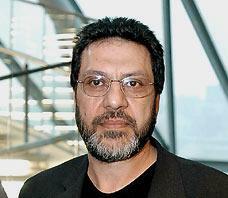 Massoud Shadjareh, head of the Islamic Human Rights Commission. July 23, 2006 update: An insight into the nature of the IHRC, thanks to the statements and actions and its chair, Massoud Shadjareh. The Mail on Sunday reveals that he has called on British Muslims to provide Hezbollah with the "financial, logistical and informational support" to attack Israeli installations. The newspaper has pictures of him wrapped in a Hezbollah flag at a rally in Trafalgar Square last year. Asked about this, Shadjareh replied that: "The wearing of the Hezbollah flag is neither uncommon nor controversial among human rights activists." Also, the Islamic Human Rights Commission has called for the occupation of Israel and "regime change" by Hezbollah. Comments: (1) What a strange definition of "human rights activist." (2) I have a penchant to attract opponents that I can boast of. Oct. 2, 2006 update: The IHRC invites nominations for the 2006 edition of its "Islamophobia award" and my name has been put forward by at least one person. Who knows, maybe this year I will get lucky? Bruce Willis – For his staunch support of the Iraq War and relentless barrage of propoganda in the guise of 'hollywood movies'. Coalition of Pro-Israel Hollywood Stars – For marching against Hizbullah and Hamas whilst the Lebanon and Gaza offensives were still on. Condoleezza Rice – For trying to change the status quo ante during the Assault on Lebanon. Daniel Pipes – For his anti-Arab, anti-Islam articles and his campaigns and discrimination against Muslims. George M Weinert V – A despicable blogger with too much time on his hands guarantees his place in the fire of hell with his endless rants on the American Jihad blog. Karol Madera – Notorious for his vilification of the mentally ill, physically disabled, Hispanics and particularly Muslims, who he refers to as 'rag heads'. He also identifies his radio station as al Qaeda Control. All this broadcast from his powerful radio station in British Columbia, Canada. Organisers of Toronto Supports Denmark Rally – This rally, led by Islamophobes ... was nothing more than an excuse for Muslim bashing under the guise of support of free speech. The anti-Muslim nature of the event was made clear when Muslim women were pelted with eggs, assaulted and verbally abused. Robert Spencer – The author of anti-Islamic books such as The Politically Incorrect Guide to Islam, as well as Islam Unveiled: Disturbing Questions About the World's Fastest Growing Faith: Islam is often vented in hateful websites such as Jihad Watch and Dhimmi Watch. Feb. 3, 2009 update: The Council on American-Islamic Relations today called me "the nation's leading Islamophobe," an honor I hardly deserve given my long-time mantra that "radical Islam is the problem, moderate Islam is the solution," but an insult by CAIR any day beats being praised by it. Sep. 17, 2010 update: A left-winger named Ray Hanania bestows on this website, www.DanielPipes.org, the distinction of being the second most "anti-Arab and anti-Muslim" hate site on the Internet. (Top honors go to www.thereligionofpeace.com, a site I often use for its compilation of Islamist attacks.) Interestingly, Hanania has to convince his readers that I am worse than I appear to be. He does this by portraying me as someone "shameless in promoting his writings falsely as balanced and fair" and who "disguises his hatred with arguments like, anti-Muslim hate crimes are exaggerated." As I happen to provide specifics on the latter, how can this be attributed to hatred? Perhaps Hanania is projecting. 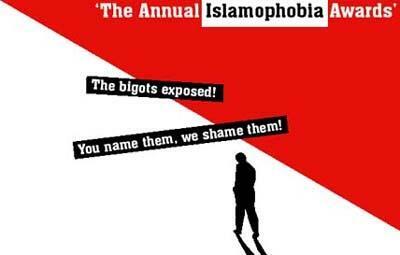 Jan. 7, 2014 update: We're not even a full week into 2014 and already Britain's Islamic Human Rights Commission has announced nominees for the "Islamophobia Awards 2014." Those folks sure are on the ball. Dave Agema, For saying "have you ever seen a Muslim do anything that contributes positively to the American way of life?" and for his "anti-Sharia bill"
Comments: (1) Odd that it's not my writings that caught IHRC's attention but the Middle East Forum Education Fund's donations. (2) Again this year, I anxiously await the award announcement. 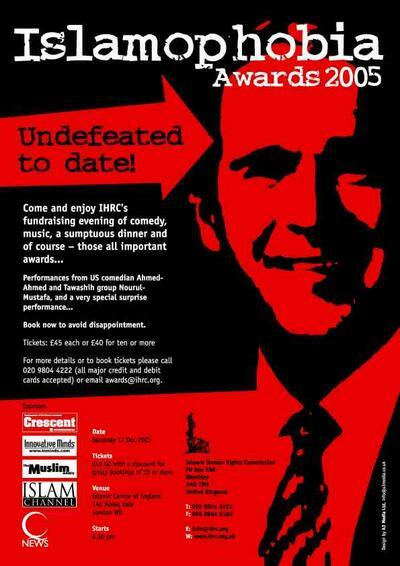 Feb. 13, 2014 updates: The IHRC reveals today that Barack Obama will be awarded its award for 2014, to be handed out on Feb. 21 at the Holiday Inn, Wembley, Empire Way, London and streamed live on www.ihrc.tv. Feb. 21, 2015 updates: I am not on this year's list. What did I do wrong? Jan. 26, 2016 update: How the mighty have fallen. My name is nowhere to be found again among the 2016 nominees.